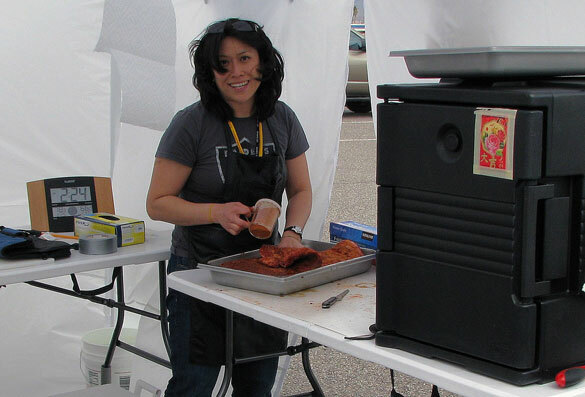 Donna Fong, Grand Champion Pitmaster, Butchers Daughter BBQ, Alameda, Calif.
Barbecue TV shows depend on drama and strong personalities. In this sense, it is no different from any other sport. Professional sports are more enjoyable if you know the players. You have to know who the athletes are to follow the sport. Tiger Woods, Jerry Rice, Bret Favre, and Kobe Bryant make for interesting drama. The West coast competition barbecue circuit has similar personalities in place to make it exciting. But big personalities don’t make up for lack of skill or talent. What’s good for TV ratings doesn’t equate to good performance on the circuit. That being said, we have our share thunderstorms, floods, grease fires, flaming smokers on the highway, RV accidents, drunken episodes, internet hostilities and scandals. But the contests keep going because there will always be people to help you when you’re in trouble and that goodwill keeps you going. I’ve been cooking on the professional circuit for three years now and consider it my second home. Each weekend, teams pack up their BBQ equipment and drive to a new location. We recreate our outdoor kitchens each Friday. Our neighbors change but the players remain the same. It’s kind of a modern migratory lifestyle. Are you bored at home? Do you know how to cook? Want to re-connect with your family members, friends or partners? Consider forming a professional BBQ team. For a $300 entry fee, you can enter a professional BBQ contest and cook against the best. All you need is some meat, spices, a smoker, a tent, a few tables and some nerve. The hardest part is getting the nerve. You have to put yourself on the line and be judged very publically by people who are not your friends. If you mess up, you’ll have to own up to it. The reward is to say you cooked with the best of them and if you’re lucky or talented enough, you might beat a few barbecue Big Boys in a category or two. If you end up winning the big shebang, you won’t forget it for the rest of your natural life. The barbecue Big Boys are easy to see. You can recognize their signature smoker or their banner names. Most of the time, they make themselves recluse to save their energies for the contest. Since they are expected to do well, they must perform. The rest of the contest is made up of judges, contest promoters, representatives from the sanctioning body, visitors and media. You have to be patient as some organizers are not very organized. And some newbie judges do not know how to judge. And some newbie cooks do not know how to cook. It is a learning experience for everyone involved. Most of all, you have to be willing to leave the comforts of home at home. Bringing it all with you will either break your bank or your will power. When I get to a contest, I get plenty of jitters during setup. I want my meat inspected as soon as possible so I can start my lengthy preparation. The contest representative will hold a cooks meeting on Friday night which can have a tempo all its own. Cooks meeting in the spring are loud. The cooks meeting in the fall are shorter and somber. Some partying and music can happen around dinner time but when curfew sets in, it gets quiet. The meats slowly go on throughout the night and into the morning. As a headcook, you may or may not get any sleep. You might have a teammate that starts his shift at assigned times. By morning, it is a fight against exhaustion. You need to think clearly to put forth some terrific barbeque. Bands begin playing music and visitors want to talk to you. The temperature can get pretty hot. It is hard to focus and you need your mental acuity to be at its highest. You need to trust your intuition and be honest with yourself when you taste your competition meat. If you can manage to turn in all of your meat on time, congratulate yourself for a job well done. Sit back and chat with another team who just turned in their meat too and enjoy the moment. In a little while, you’ll have to put your game face on again and pack up the mess you just made and bring it all home. With any luck, you can bring home a trophy as a memento of a day hard fought. This is a sport that money can’t buy. Respect comes from cooking hard and being an honest and decent neighbor. The barbecue TV shows may come and go but the friendships that develop on the circuit are real and tangible. There is more camaraderie than showmanship. There is more teaching than hiding of secrets. Secrets are only valuable if you’re winning. Nobody cares what your secrets are if you are on the bottom. It is a tough sport to maintain year after year. I take off my hat to those who can cook on the circuit for more than 5 years. Fortunately, there is more than one aspect to competitive barbecue I love. You can cook, clean, judge, organize, write, or photograph. It is all good. Outstanding comments, Donna. You have described bbq competitions very well. Thank you! Thank you for allowing me to share the experience of competition barbeque. The attention to detail, preparation and sheer iron will was apparent in everything you did. Your ability to create excellent BBQ and be so graceful under fire taught me a lot. My (amatuer)chef hat is tipped to you and your fellow competitors! The pleasure was entirely ours Leslie. Thanks for all of your support. It was so nice to meet you! You are a class act in and out of the BBQ pit. Excellent summary of the competition craziness. I spent most of my life competing in the business world and don’t wish to continue it into the pleasure of BBQ. I respect those of you that are willing to stress out over the weekend and still make it back to work on Monday. I have to admit that there are ups and downs during every contest. I figured out during the last one that the highest I get is right as I enter the contest site on Friday. The lowest is either in the middle of cleanup after turn in or after being skunked at awards! It is physically and mentally challenging for sure! Well said, espically the nerve thing. I started last year at the bakersfields baddest, it was so much fun once i got past the nerves. Donna was the first BBQ’ER to come up and say hi and introduce herself at the cooks meeting. Thank you Donna for that. Since then i have made a lot of great friends, competitors and learned a ton of things about BBQ competition. Work has kept me away this year but i long for the competition and will be back out there soon. I think if there is one reason why I keep going it is because of people exactly like you! The friends you make on the road are just so terrific. Have I ever told you how I love reading your dead on articles…mmmmmm. You always make me smile. Nice article Donna! I’d say there’s also competition as a judge in SoCal in just getting in on a contest ! There are so many judges now there’s often a wait list to get on, or a short window of opportunity just to try and sign up. But I hope to get to a competition soon and I’ll stop by after to say hi! Take care. Great article! Immediately shared it with my team. Being rookies to this game, we appreciate your perspective. Looking forward to seeing you and Harry on the bbq trail. Great read Donna. We have made some great friends out on the BBQ trail. We are looking forward to the start of the season in two weeks. One great story that I have is from Harrisburg last year. We were set up and our neighbors pulled in. They were short an extension cord. We offered one of our and our water hose. The next morning, I realized I had left our butter at home. Our neighbors heard us and when he came back from a grocery run, a pound of butter mysteriously showed up on our table. We help each other out. It is what we do. Great story of kindness among the great BBQ community! Read Harry’s WSM seasoning tips. I love your writing! Best of luck, Rob Z.